We had another day of weird snow/rain/sleet- it was cool and crisp and all the tops of the mountains were dusted white. It makes for beautiful views and photos- but not so great when you’re leaving the store in the middle of a freak rain/snow downpour. Hopefully everyone enjoyed their Columbus Day- the state of Utah apparently doesn’t recognize this holiday, kids were in school and most businesses where open – unless of course you’re the state liquor store which uses any excuse to close. As I posted a few weeks ago, I’ve decided to post some great Thanksgiving recipes in the month of October! Over the weekend I asked people to post to Facebook what their favorite side veggie is and I got an overwhelming response for BRUSSELS SPROUTS – which are also one of my all-time favorites! If you haven’t seen my recipe for Maple-Roasted Brussels Sprouts with Rutabaga and Toasted Hazelnuts its also a winner! As promised here is an amazing recipe for Brussels Sprouts and thank you to everyone that gave their input for their favorite veggie! These Brussels sprouts are so delicious, the Beurre Noisette (which is just fancy French for browned butter- but sounds so much better) gives the recipe a wonderful nutty flavor that is balanced by the apple cider and nutmeg. 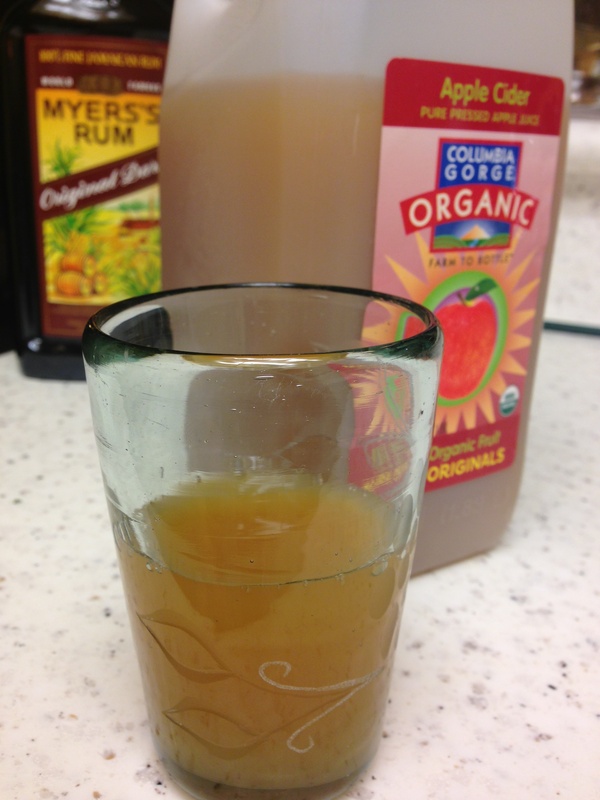 The best part about cooking with fresh apple cider? Cocktails! I know you can see that little bottle of Myers’s Rum peeking out from behind the jug of cider. It always seems to find its way out of the liquor cabinet when there’s cider around, plus cooking is always better when you’re sipping on wine or my favorite fall cocktail, Rum & Cider. Thanks to the unwavering recipes from Food52 this rich, creamy and delicious dish is one of the better Brussels Sprouts recipes I’ve tried! Enjoy! Wash and trim the stems from the brussels sprouts. Cut in half, discarding any discolored leaves. 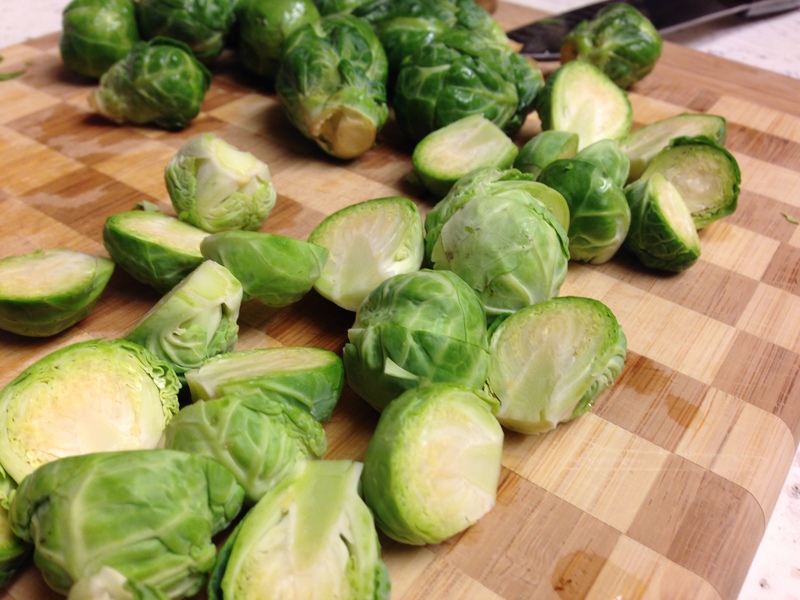 Steam brussels sprouts over salted water until fork tender (7-10minutes). Drain and lightly sprinkle and toss with celery salt. Set aside. In a separate pan, cook bacon until crisp- transfer bacon to paper towels to drain, then chop coarsely. Over low heat, melt butter in a heavy pot. Once the butter is completely melted, turn heat to medium high. It will quickly begin to foam. Keep stirring the butter and moving around the pan. Once it hits the color and flavor you want (don’t let it turn black and burn- medium to dark brown is good), immediate reduce the heat to low and add the cream. Stir to completely incorporate the cream. Immediately add the apple pieces, bacon and brussels sprouts. Don’t worry if the sauce looks like its starting to separate- continue stirring! 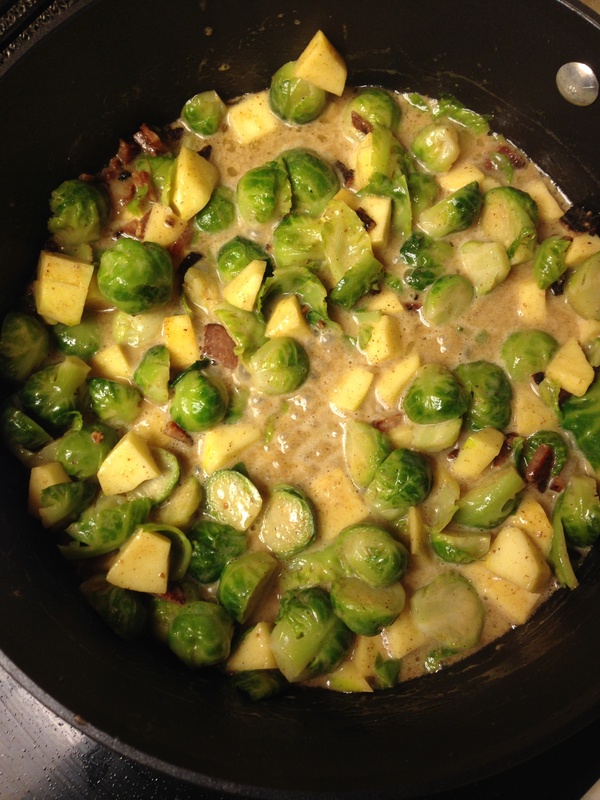 With a large spoon, keep turning the brussels sprouts mixture in the cream/noisette sauce while the sauce thickens and the brussels sprouts mixture becomes glazed with the sauce (5-10 minutes). The apple pieces should be just cooked, not mushy. Add the apple cider and nutmeg. Continue to carefully turn the mixture in the glaze for another 2-3 minutes. Turn out in a serving dish or the individual plates and add a pinch of nutmeg over the dish. 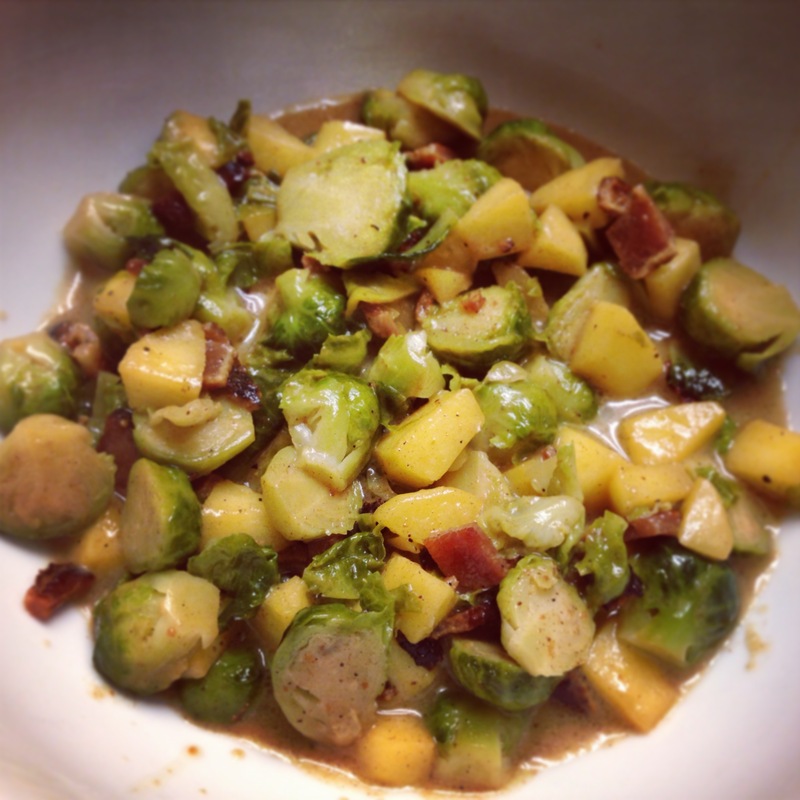 This entry was posted in Holiday Dishes, Recipes, Sides and tagged Apples, apples and bacon, beurre noisette, browned butter sauce, brussels sprouts, Holiday dishes, Thanksgiving side dishes by skibootsinthekitchen. Bookmark the permalink.